Last week, the Atlanta Dream held the best record in the WNBA along with Chicago; this week, the Dream holds that distinction alone. Atlanta improved to 6-1 with two big home victories over Seattle and Chicago over the weekend. The Dream stopped the Storm with a tremendous defensive effort, holding Seattle to just 59 points and an incredible four points in the third quarter. Angel McCoughtry seemed to be everywhere, as the star forward poured in a game-high 23 points. McCoughtry was aggressive on both ends of the floor, grabbing nine rebounds, five steals and adding seven assists. It was an overall great effort from the Dream’s top scorer. 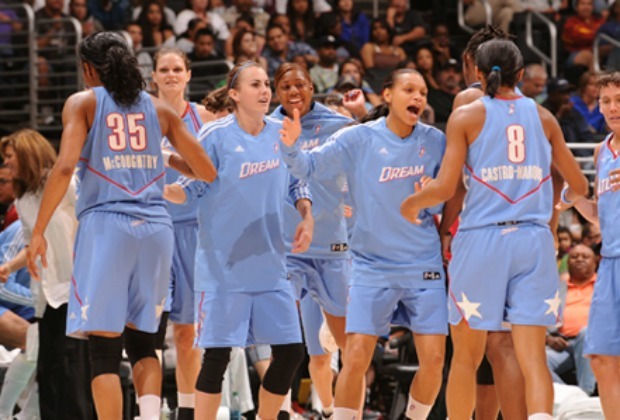 Again on Sunday, defense was the key to victory in an 88-74 win over Chicago, and again McCoughtry was the leader. No. 35 scored 23 points and added six rebounds, three steals and four blocks against one of the top rookie forwards in Elena Delle Donne. Tiffany Hayes came off the bench to score 16 points for the Dream. The win over Chicago was big because the Sky will be in contention for the top spot in the Eastern Conference this year along with Atlanta. Angel McCoughtry and crew are well aware of the competition that Chicago poses. Each week that goes by seems the same for the Dream and their star player Angel McCoughtry. For the ninth time in her career and second time this season, McCoughtry was named WNBA Eastern Conference Player of the Week. The forward averaged 23 points, 7.5 rebounds, 4.5 assists, four steals and 2.5 blocks per game in leading Atlanta to a 2-0 record last week. McCoughtry looks like the best player on the floor both offensively and defensively and at every critical juncture of the game. She has a great ability to box out for rebounds, even when there are two players from the opposing team in her way. Atlanta has arguably the best all-around player in the WNBA today. For most fans, it really isn’t much of an argument: McCoughtry is the best. After notching two more wins at home last week, the Dream will take the league’s best record into Connecticut on Sunday for an afternoon tilt with the Sun. This will be the first of five matchups with Connecticut this season for Atlanta. The Dream was 1-3 against the Sun in 2012. Connecticut comes into Sunday’s game with a 2-5 record and a two-game losing streak. The Sun is fifth in the Eastern Conference, but still can be dangerous at times with stars like third-year center Tina Charles and veteran guard Kara Lawson. Charles ranks eighth in the WNBA in scoring with 18.6 points per game. Lawson is one of the top passers in the league and she is 10th in the WNBA with 4.2 assists per game. It will be interesting to see how center Ruth Riley meshes with her new Dream teammates. If she can conjure up the magic of seasons past, Atlanta could be on the way to a very special season.